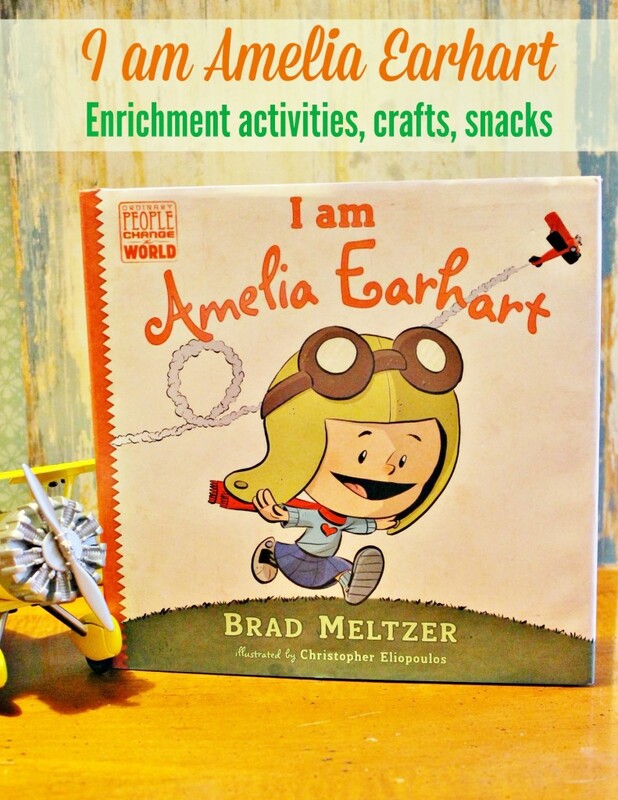 I am Amelia Earhart by Brad Meltzer has done an amazing job of taking a historical figure and making them real and someone you can relate with- even for small children. This book is perfect for turning into a fun unit study for your kids just like our I am Abraham Lincoln unit study, but this time with a little girl power. Whether you home school or you are looking for some enrichment activities to do with your kids you can do all the activities, crafts, and snacks here or just choose your favorites. Appealing to a child’s sense of touch really helps facts to stick, and learning through play is the best way to teach – especially when teaching little ones. The more hands-on projects are the more fun they are to children which gives them a pride and ownership in their work. 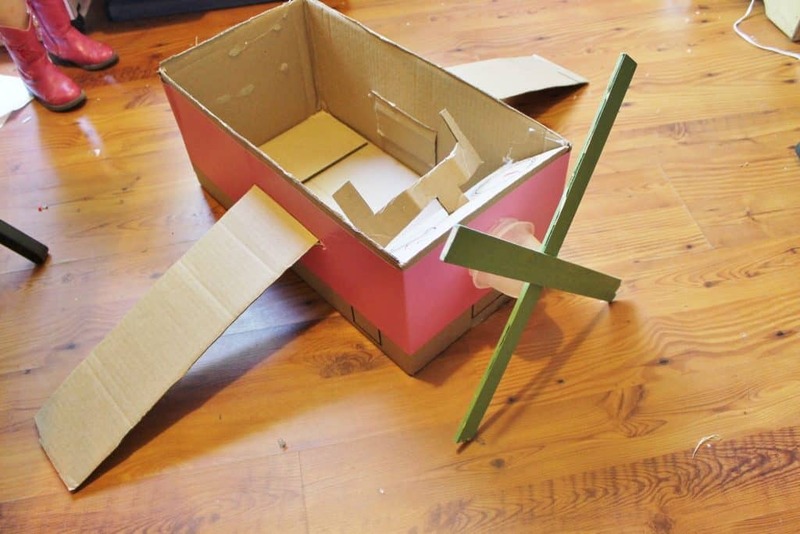 Airplane Box– There are not many things that hold a child’s attention more than a big cardboard box. Grab one from your closest grocery, moving, or appliance store. COVER your floor well with a drop cloth (I use a shower curtain liner from Dollar Tree) or take it outside. Set out paint, tape, crayons, stickers, and anything else you can think of to fuel your child’s imagination. Let them decorate their own plane and then board for hours and hours of dramatic play. For our box I cut off 3 sides, leaving the one in front to draw dials. I used the two long flaps as wings, cutting a “slot” in both sides of the box, slide box flap into hole, fold over about 4” and hot glue or tape inside box to secure. I love getting kids up and moving indoors and out in the midst of learning activities. Exercising body and brain helps them to be open to take in more knowledge. Packing For a Trip– Dramatic Play- Decide on somewhere to take a trip; Hawaii, Italy, etc.. Grab a suitcase or duffel bag and then help your child gather appropriate clothing and other items for the trip by discussing the climate, and things that might be on your itinerary. Besides being just a fun activity this is a great critical thinking activity and fine motor skill builder. 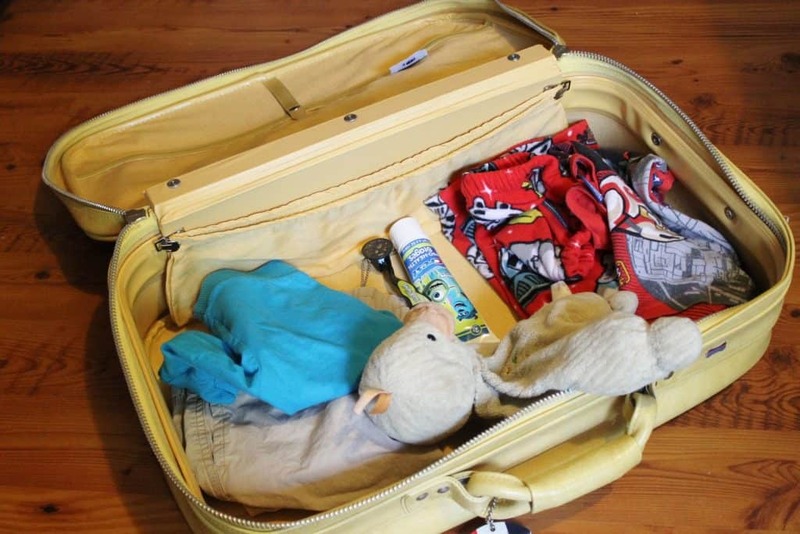 Picking out what items are fitting for a particular trip, folding clothes, positioning them in the bag are all beneficial to teaching your child something. Themed snacks are a fun way to keep the kids interested in a topic and even sneak in some learning. 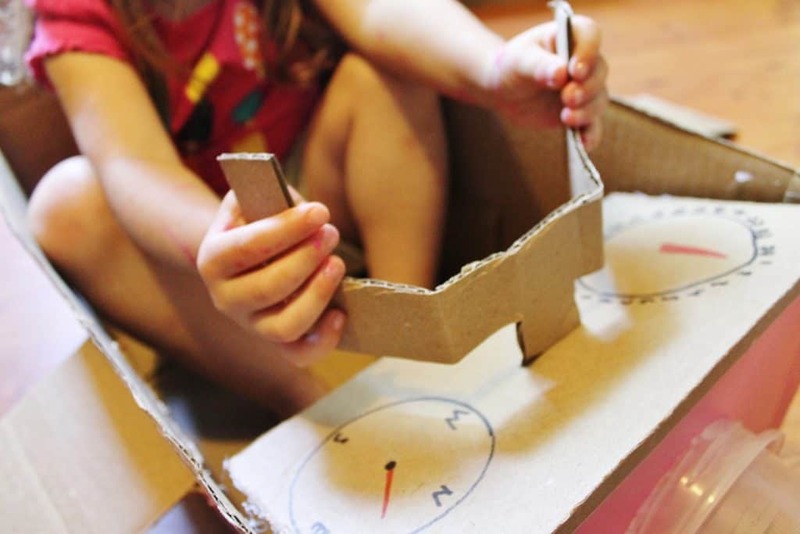 Use whatever you have on hand to create airplanes, airplane parts, a blue sky with fluffy clouds, or anything else your little aviator might enjoy. Propellers– Fresh fruit makes great airplane parts. 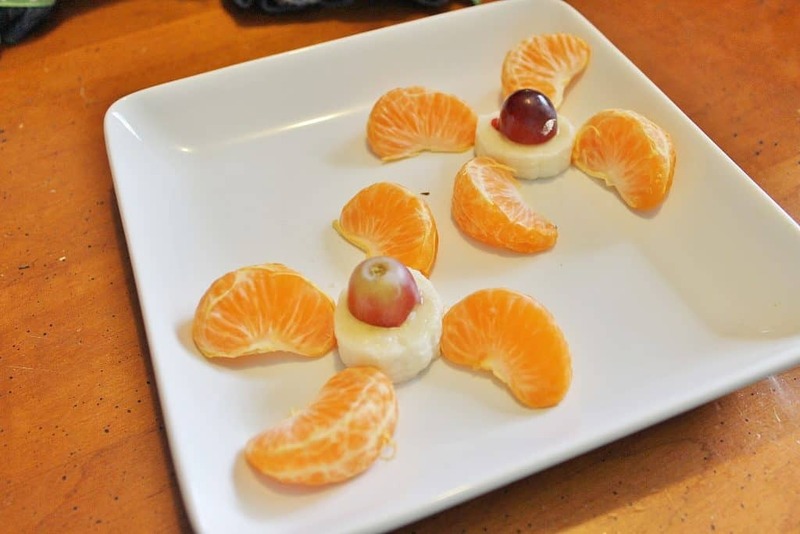 Cut banana into slices, add clementine segments for propellers and half a grape for the nose. STAY TUNED! Every day for 5 days we will have a NEW mini Unit Study to pair up with this book! I thought it was the perfect series to launch while I am on our cross-country road trip! Happy adventures! Don’t miss out on our DAY 3 Amelia Earhart Unit Study where we had Cloud Parfaits and created Airplane Clothespin toys!